The Readability Measures feature in Microsoft Word and Outlook are helpful tools to measure words per sentence, passive voice percentage, the Flesch Reading Ease, and Flesch-Kincaid Grade Level in your documents. 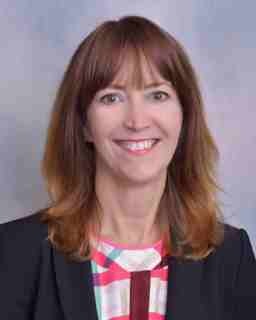 Together, they offer a measure of the clarity in your business writing. 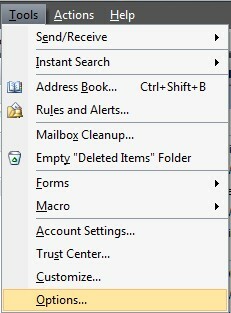 First, click on the Office Button and then go to Word Options, as shown below. In the Word Options window, go to the Proofing section. 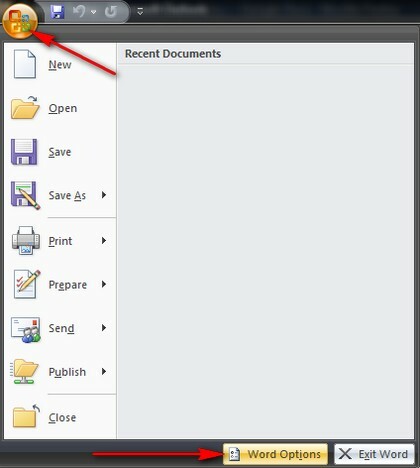 In that section, check the option which says ‘Show readability statistics’ and click on OK.
Once this option is enabled, you can check the readability of any text by pressing the F7 key. 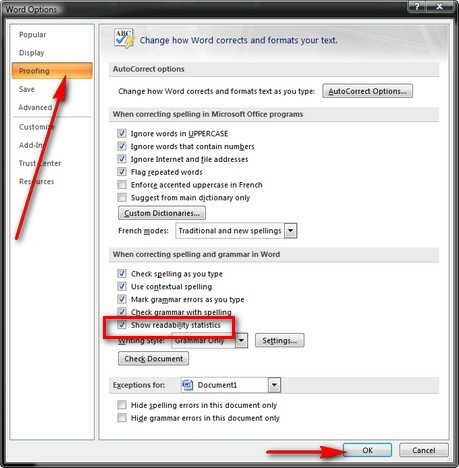 Microsoft Word 2007 will first make a spell check of the selected text and, at the end, it will show you the readability statistics. In Microsoft Outlook 2007, the procedure is slightly different. First, go to Tools -> Options. In the Options window, go to the Spelling tab. It is a good idea to check the two available options: ‘Always check spelling before sending’ and ‘Ignore original message text in reply or forward’. 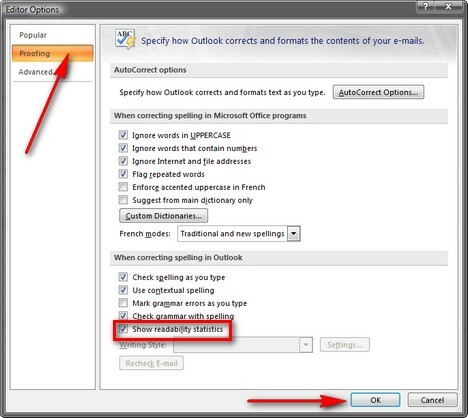 By enabling these options, Outlook will always check the correctness of your e-mails before sending them. Once you have done this, click on the ‘Spelling and AutoCorrection’ button. In the Editor Options window, go to the Proofing section. Check the option which says ‘Show readability statistics’ and click on OK.
Now, before sending an e-mail message, Outlook will first make a spell check of your message and then will show you the readability statistics. 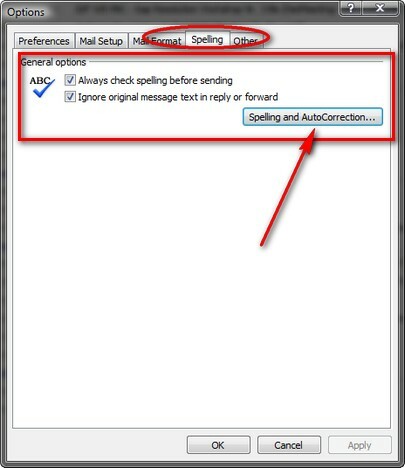 If you did not check the ‘Always check spelling before sending’ option from the Spelling tab, Outlook will not check automatically the readability of your message. You can do this manually by pressing the F7 key before sending the message. NOTE: The readability statistics are not available for Powerpoint and Excel. You won’t find them in the configuration options. 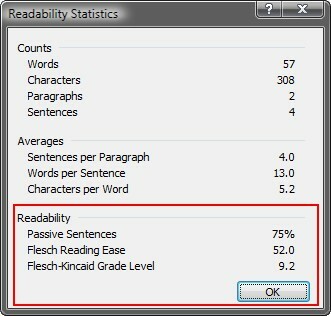 In Microsoft Office 2003, the readability statistics are available only in Word.